Your home is your castle, except when it comes to rodents. These invaders storm your roof, occupy wall space and attics, burrow beneath foundations, plunder available food sources, and establish a breeding colony all in short order. But the presence of rats does not mean homeowners are unclean. Rats and mice are simply opportunistic critters always in search of food and shelter, and many Lamorindans unknowingly provide both. 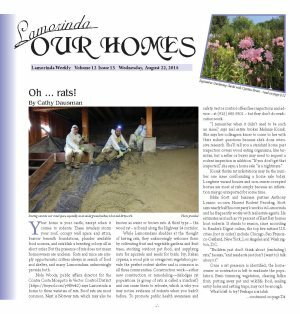 Nola Woods, public affairs director for the Contra Costa Mosquito & Vector Control District (https://tinyurl.com/y9fl9vk2) says Lamorinda is home to three varieties of rats. Roof rats are most common. Next is Norway rats, which may also be known as water or brown rats. A third type - the wood rat - is found along the Highway 24 corridor. While Lamorindans shudder at the thought of having rats, they unknowingly welcome them by cultivating fruit and vegetable gardens and fruit trees, stocking outdoor pet food, and supplying nuts for squirrels and seeds for birds. Ivy, Italian cypress, a wood pile or overgrown vegetation provide the perfect rodent shelter and is common in all three communities. 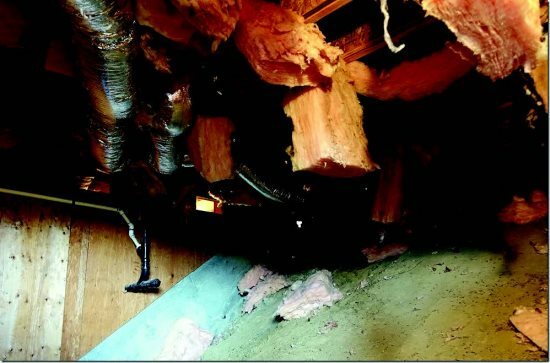 Construction work-either new construction or remodeling-dislodges rat populations (a group of rats is called a mischief) and can cause them to relocate, which is why you may notice evidence of rodents when you hadn't before. To promote public health awareness and safety, vector control offers free inspections and advice - at (925) 685-9301 - but they don't do eradication work. "I remember when it didn't used to be such an issue," says real estate broker Melanie Kozak. She says her colleagues know to come to her with their rodent questions because she's done intensive research. She'll tell you a standard home pest inspection covers wood eating organisms, like termites, but a seller or buyer may need to request a rodent inspection in addition. "If you don't get that inspected," she says, a home sale "is a nightmare." 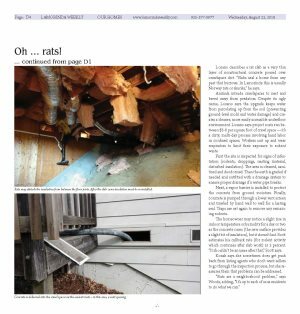 Kozak thinks rat infestations may be the number one issue confounding a home sale today. Longtime vacant houses and non-owner-occupied homes are most at risk simply because an infestation may go unreported for some time. Mike Scott and business partner Anthony Lozano co-own Honest Rodent Proofing. Scott says nearly half his company's work is in Lamorinda and he frequently works with real estate agents. 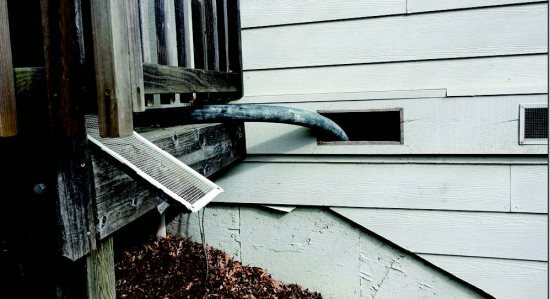 He estimates as much as 70 percent of East Bay homes host rodents. It stands to reason, since according to Reader's Digest online, the top five rattiest U.S. cities (not in order) include Chicago, San Francisco-Oakland, New York, Los Angeles and Washington, D.C.
"Builders just don't think about (excluding) rats," he says, "and residents just don't (want to) talk about it." Once a rat presence is identified, the homeowner or contractor is left to eradicate the population. Even trimming vegetation, clearing fallen fruit, putting away pet and wildlife food, sealing entry holes and setting traps, may not be enough. What's left to try? Perhaps a rat slab. 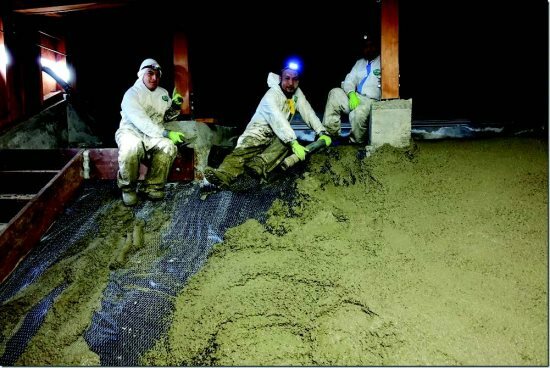 Lozano describes a rat slab as a very thin layer of nonstructural concrete poured over crawlspace dirt. "Slabs seal a home from any pest that burrows. In Lamorinda this is usually Norway rats or skunks," he says. Animals intrude crawlspaces to nest and breed away from predators. Despite its ugly name, Lozano says the upgrade keeps water from percolating up from the soil (preventing ground-level mold and water damage) and creates a cleaner, more easily accessible underfloor environment. Lozano says project costs run between $5-6 per square foot of crawl space -it's a dirty, multi-day process involving hand labor in confined spaces. Workers suit up and wear respirators to limit their exposure to rodent waste. First the site is inspected for signs of infestation (rodents, droppings, nesting material, disturbed insulation). The area is cleaned, sanitized and deodorized. Then the earth is graded if needed and outfitted with a drainage system to ensure proper drainage if a water pipe breaks. Next, a vapor barrier is installed to protect the concrete from ground moisture. Finally, concrete is pumped through a lower vent screen and trawled by hand wall to wall for a lasting seal. Traps are set again to remove any remaining rodents. The homeowner may notice a slight rise in indoor temperature or humidity for a day or two as the concrete cures (the new surface provides a slight bit of insulation), but it doesn't last. Scott estimates his callback rate (for rodent activity which continues after slab work) at 3 percent. "It shouldn't be an issue after that," Scott says. Kozak says she sometimes does get push back from listing agents who don't want sellers to go through the inspection process, but she reassures them that problems can be addressed. "Rats are a neighborhood problem," says Woods, adding, "It's up to each of us as residents to do what we can." Rats may disturb the insulation from between the floor joists. After the slab cures insulation must be re-installed. Concrete is delivered into the crawl space via the easiest route - in this case, a vent opening.